Occupational Safety and Health Administration (OSHA) revealed that 70% of workers who suffered hand injuries in manufacturing were not wearing gloves. Hand injuries among the remaining 30% were because hand protection was inadequate, damaged, or misapplied. Leather Work Gloves offer protection from sparks, rough objects, heat, and injuries in heavy-duty industrial and commercial applications. Leather is naturally designed to provide comfort, dexterity, durability, and abrasion protection and mild heat resistance. The features and benefits of using leather gloves make leather a traditional favorite for industrial workers. Workers use a variety of tools and protective equipment at work to ensure protection against occupational hazards. Hand protection equipment is one of the most important protective equipment you need to protect your hands from sparks, cuts, spills, and other workplace hazards. Since there is a broad range of leather work gloves available in the market, it can be challenging to select the appropriate pair for your work environment. Hazard assessment is a crucial step towards implementing the right safety equipment at your workplace. Hazard assessment will help you understand the nature and severity of hazards that might affect employees’ hands or cause hand injuries. For example, if your employees have to deal with sharp pieces of machinery, needles or blades of tools that can damage the skin on hands, provide your employees with gloves designed to protect against these hazards. When it comes to heavy-duty hand protection products, you can’t find anything better than leather gloves. Leather is resistant to heat, punctures, and tearing. And it becomes pliable and softer with use. Warm in the winter and cool in the summer, leather is the best material to produce gloves for various industrial and commercial use. Often, leather palm gloves offer much better feel, comfort, cut resistance, and last longer. Like any other personal protective equipment, leather gloves must be appropriate for the task and hazards present and they need to fit wearer’s hand properly. When examining a task to select the right glove, determine whether your job involves any hazardous chemicals or sharp objects. Some hazards may not seem dangerous but they can damage your skin over time. Choosing gloves designed for your work environment is therefore important. Understand various types of work leather gloves to select one which fits your profession. Pigskin leather is one of the most versatile forms of leather which offers durability, breathability, and water resistance making it ideal for many commercial applications. Because of its porous nature, pigskin leather becomes softer with use and stays cooler. Pigskin Gloves are a great hand protection solution for application where movement, safety, and comfort are priorities. The strength and dexterity of goatskin leather ensures hand protection against many hazards. Because of natural lanolin in the skin which delivers high water and abrasion resistance. 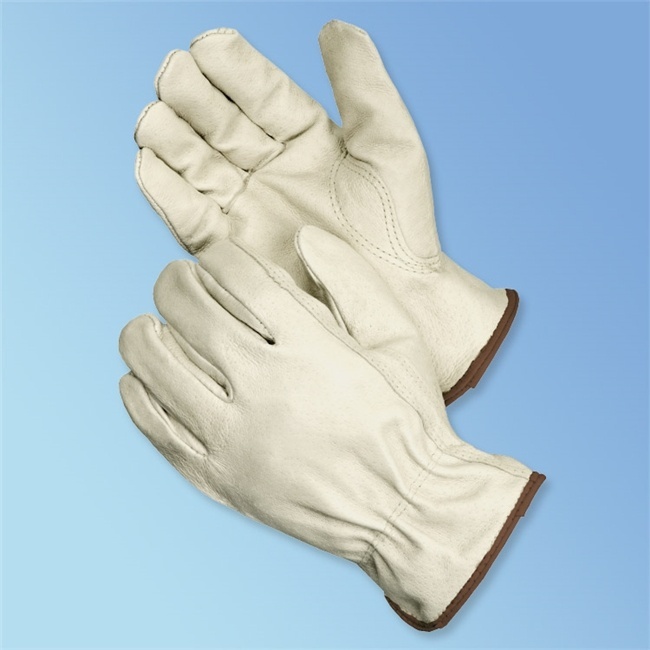 Goatskin Driver Gloves provide impeccable protection against weather, cuts, and sparks. Cowhide leather is one of the most common hides used for professional gloves. Because of its comfort, economy, abrasion-resistant properties, and durability. Cowhide has a longer break-in period and more heat-resistant than goatskin and pigskin. Cowhide Driver Gloves are designed to provide the greatest strength, comfort, and protection. So if your application requires exceptional durability go for cowhide, goatskin or even pigskin. With cowhide being the most durable. 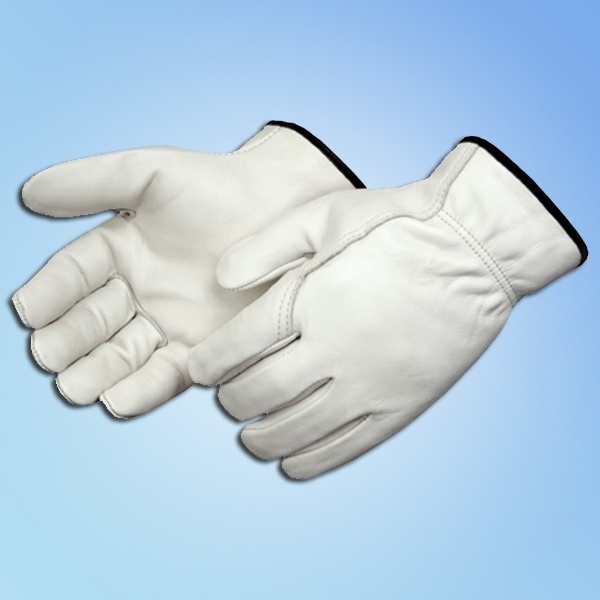 Goatskin is a good choice for ultrafine dexterity required for some welding gloves. Leather work gloves are considered as the most commonly used personal protective equipment. While leather provides protection to the hands, wrists and fingers, they have limitations. For instance, if leather gloves are exposed to chemicals for a long period of time, they will start breaking down allowing the chemicals to seep through. Your employees must understand that protective equipment provide protection against occupational hazards up to a certain point. So, leather gloves are best for protection from rough objects, sparks and heat. And for cushioning from light blows in heavy-duty work requirements. All kinds of leather provide comfort, durability, dexterity, mild heat resistance and abrasion protection. Because of these advantages, leather is a traditional favorite for industrial workers. 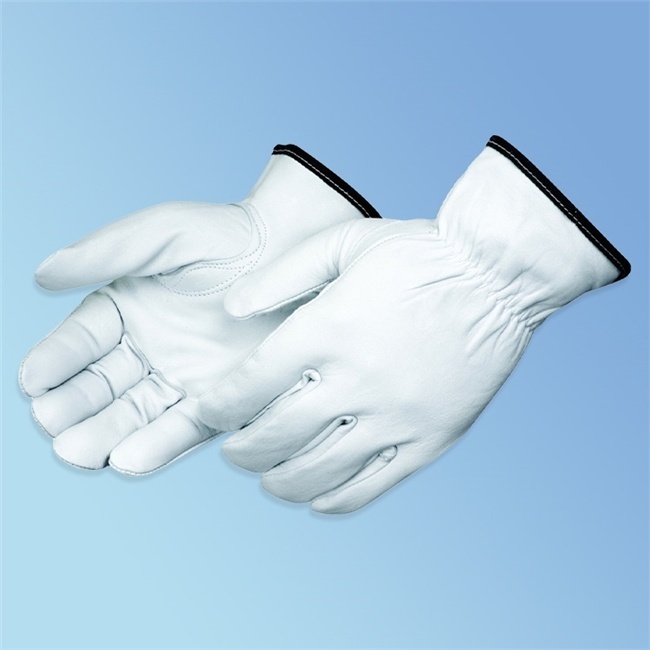 Now whether your profession requires deerskin gloves or disposable gloves, Harmony Business Supplies offers a complete range of occupational gloves made for a broad range of industries. Browse through our online store to learn more about our collection of leather driver gloves and other personal protective equipment! Read How to Prevent Hand Injuries with different types of gloves. The first thing you need to figure out is whether your employees should wear sleeves at all. If their job gives them burns and cuts, the answer is yes. Gloves with extra long cuffs can protect the arms (See: Hand Injuries & Prevention). However, use breathable cut resistant sleeves because extended cuffs don’t cover as much of the arm as a sleeve does. Protection from scrapes and cuts! These Cut Resistant Sleeves provide ASTM cut-level 2 (650 grams of cut resistance) protection at less than the cost of kevlar sleeves. As the name suggests, the major advantage of wearing cut-resistant sleeves is protection against cuts. However it is not advisable to expose your arms to cut threats when you don’t have the proper protective equipment. In addition there are different styles of breathable cut resistant sleeves with a variety of ASTM cut resistance ratings. And the right use of kevlar cut resistant sleeves will keep your arms protected from sharp materials no matter the industry. So if you or your employees work around welding spatters or flames, kevlar sleeves arm protection can help avoid burns and skin injuries. Sometimes people overlook the need for arm sleeves, which is not at all a good practice. 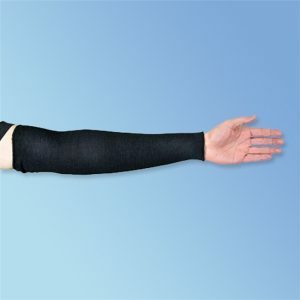 As a safety manager, make sure you get comfortable and reliable arm sleeves for your employees so they cover as much of their arms as possible. While mentioned earlier, cut-resistant sleeves protect the wearer against cuts, they also provide some protection against heat and burns. Most of all it is important that you get protective equipment which is effective against many workplace hazards. If you are associated with the industry where you have to deal with various kinds of hazards, go for multi-purpose kevlar cut resistant sleeves. 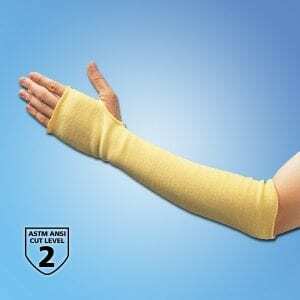 Kevlar Sleeves offer Protection from scrapes, cuts, and minor heats and burns. If your profession requires you to carry materials that are large and sharp, you might end up brushing against your arms. So, wearing full arm sleeves will help you avoid scratches and brushes during material handling. So talk to one of our representatives at Harmony Business Supplies to help you determine which sleeve is best for your work environment. Check out our breathable cut resistant arm sleeves to learn more about our arm protection solutions! No matter which material you need, you can count on great volume discounts, fast shipping and the best customer service when you shop with us at Harmony Business Supplies.